New members very welcome, in particular Altos. A warm welcome to our new organist, Siona Leitch, from Skelmorlie & Wemyss Bay Church. Siona will play for both church services. She can be contacted on 01475 521596 or email: aleitch@tiscali.co.uk. 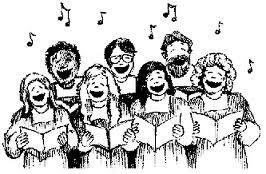 There will be a Choir practice in the Bonomy Room of the hall on Wednesday evenings at 7.30 pm. New recruits welcome, good exercise and good fun “GIVE IT A BIRL"